Gilead Christian School Chamber of Commerce Student of the Month, Tori Griffin, with Brad Ebersole of Consolidated Cooperative. Mount Gilead High School Chamber of Commerce Student of the Month, Casey White, with Brad Ebersole of Consolidated Cooperative. 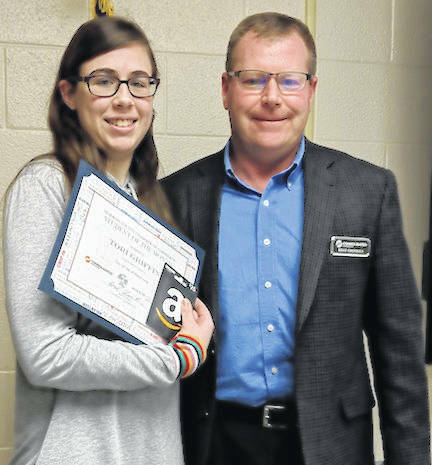 MOUNT GILEAD — Two local students were recognized at the March 19 lunch meeting of the Morrow County Chamber of Commerce. Mount Gilead High School faculty chose Casey White as Mount Gilead High School Student of the month for 2019. The award with a $25 Amazon gift certificate was presented by Consolidated Cooperative Business Specialist, Brad Ebersole. MGHS Principal Deb Clauss said Casey is a well-rounded young man who represents the school with honor and pride. He is an Academic All-Ohioan in cross country, indoor track and outdoor track, First Team All-Ohioan in all three sports, KMAC Scholar Athlete of the Year and the Ohio High School Athletic Association Scholar Athlete. 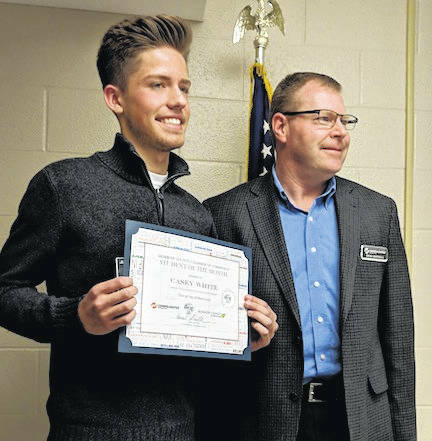 Clauss said Casey has been honored on the Superintendent’s Academic Honor Roll all four years of high school and is a member of the National Honor Society. He is currently a Salutatorian of the Class of 2019 with a GPA of 4.27. Casey performs with the Show Choir, the Audition Choir and received Superior ratings the past two years at the OMEA Solo/ensemble Contest. Ebersole got a chuckle from Chamber members when he added that “in his spare time,” Casey is involved in Student Council, is the Vice President of his Senior Class and works at Pizza Hut. Casey plans to attend college, but is undecided on a major or where he will attend. His parents are Mark and Leslie White and his grandparents are Laverna and Donald White. Gilead Christian School Administrator Bryan Potteiger calls Tori Griffin a perfect example of the vision statement for GCS. He said she does this by pursuing academic excellence and serving as an example of a Christ-centered disciple in her interactions with others. Academically, Tori has worked hard for the grades she has earned and she found strategies that worked best for her learning style. She serves as a role model to other students by mentoring them for academic improvement. Tori, a junior, earned a three year varsity award in bowling and earned her first year letter in volleyball. She has also participated in the school plays and this year served as student director for the school production of Winnie the Pooh. In the community, Tori volunteers for the Delaware Humane Society and her love for cats is well known among her peers. Whether in the classroom hallway, cafeteria or at a school activity, Tori makes sure everyone is included. Faculty at GCS say that her kind and caring personality is what makes her the 2019 Student of the month nominee for Gilead Christian School. Tori plans to attend college after graduation, however she is undecided on a major or what college she wants to attend. Two areas of interest for her are teaching and working as a humane agent. Tori’s parents are Bill and Pegg Griffin. Ebersole also presented Tori with the Student of the Month award along with a $25 Amazon gift card. Consolidated Cooperative is the sponsor for the Morrow County Chamber of Commerce Student of the Month awards.